Design controls are a set of policies and practices intended to ensure consistent translation of input requirements into a physical product that meets those requirements. ISO 13485:2016 sets out a series of requirements for design controls. So how can you actually apply, manage and use our software for the complete design control process? We asked Mark Brook, Senior Service Implementation Manager at Qualsys to explain how Qualsys's design control software helps businesses to comply with ISO 13485:2016 for medical device design controls. Each of the sub-clauses in 7.3 require documented SOPs. Our software takes this one step further - it enables you to enforce each of the procedures, making quality by design and default. It's a much more natural way to plan, record and manage quality - an approach preferred by auditors. Rather than SOPs which are bolted-on, they are embedded. Quality is part of the culture. It's no longer a "quality management system" as such, it's the business management system. This is how businesses are achieving ISO standards like ISO 13485 without even one minor non-conformity. Everything is considered throughout, there is full traceability - nothing can be missed. I've provided some examples of what I mean below based on some of my recent experiences helping organisations implement a truly integrated medical device quality management systems using our software. Document Manager enables you to prepare procedures for design and development. The system also automatically generates and sends notifications via users personal To-Do-List and Email. To-Do List notifications contain a link direct to the relevant document and, where required, a tick box to acknowledge 'read and understood'. The system provides full visibility into who has confirmed a 'read and understood' receipt of new or changed documents and highlights outstanding user actions via both the KPI Dashboard and standard reports. Plan and control product design and development. Retain and maintain planning documents. Document the design and development stages. Document responsibilities and authorities for design and development. Document the methods to ensure traceability of outputs. In the design and development planning phase, you also need to identify user needs, conduct a preliminary risk assessment and put together your risk management plan. Risk Manager stores risk information in a central, searchable database repository. Users may define as many classifications for Risk Likelihood, risk categories, risk types etc. as required for inclusion in risk templates for different types of risk. Risks in Risk Manager can even be associated with documentation controlled in Document Manager, so any changes can be easily managed at a later date. Document review dates can also be scheduled in the system and records associated with the reviews. Training Record Manager enables you to manage and control the competence resources needed for the project. Once the user needs have been established, you need to establish your design and development inputs. Ensure design and development outputs meet input requirements. Provide appropriate information or purchasing, production and service. Ensure design and development outputs contain or reference product acceptance criteria. Ensure design and development outputs specify the characteristics of the product that are essential for its safe and proper use. Ensure design and development outputs are in a form suitable for verification and against inputs. Ensure design and development outputs approved prior to release. Retain records of design and development outputs. Design and development review requires you to define the requirements and process of collecting peer input at various points in the development process. In Document Manager, the system can enforce a defined approval workflow. 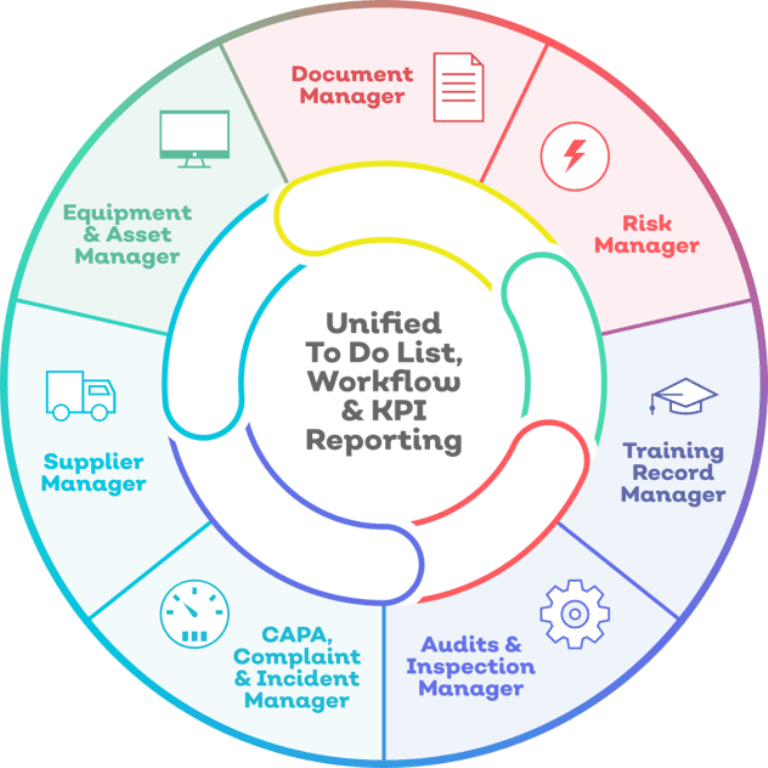 Only when the workflow has been completed, with all required approvals given, will the document be automatically published and made available to authorised users. If approval is rejected then the document will not be published but will be retained, with restricted access, for information and the document owner notified. The rejected document must be deleted before a replacement can be uploaded. Perform systematic reviews of design and development at suitable stages. Ensure that representatives of functions concerned with the stages being reviewed are participating in these reviews. Retain records of the results of the reviews and necessary actions. Design verification proves the medical device has been designed correctly. In Audit Manager authorised users are able to schedule audits. Records of audits and inspections, together with details of corrective and preventative actions and any supporting information is held in a central, searchable repository. Users are able to create template action types to categorise particular types of response. Perform design and development verification in accordance with planned and documented arrangements. Include in the verification the confirmation that the design outputs meet design outputs when connected or interfaced. Retain records of the results and conclusions of the verification and necessary actions. Design validation is about proving you designed the correct medical device. Any issues can be raised in CAPA Manager. The super users are able to tailor the issue recording forms and template workflows for different types of event to ensure they are managed appropriately. Perform design and development validation in accordance with planned and documented arrangements. Conduct design validation on representative product. Record the rationale for the choice of product used for validation. Perform clinical evaluations or performance evaluations of the medical device as part of design and development validation in accordance with applicable regulatory requirements. Include in the validation confirmation that the requirements for the specified application or intended use have been met when so connected or interfaced. Complete validation prior to release for use of product to the customer. Retain records of the results and conclusion of validation and necessary actions. Document Manager enables you to document a procedure for transferring design and development outputs to manufacturing. You must record results and conclusions of the transfer. Equipment Manager enables you to maintain a repository of equipment assets, associate any processes and procedures with equipment records, and demonstrate tehat the production capability can meet the product requirements. CAPA Manager enables you to manage the documented procedures to control design and development changes. Dynamic forms enable you to customise the response based on the determined significance of change. All documents, audits, equipment, supplier histories, can be associated with the changes to ensure proper control for reviewing, verifying, validating, approving, and retaining records of changes. The system has a flexible architecture which makes it easy to maintain a design and development file for each medical device type or family. Include or reference in this file records for design and development changes.